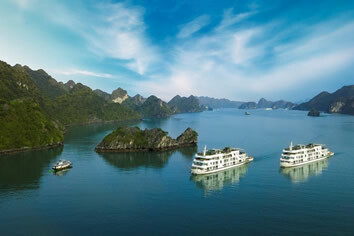 Hanoi, Ha Long Bay Cruise, Hue, Hoi An, Ho Chi Minh City, and more! Arrange your flight to arrive in Hanoi, Vietnam by mid-afternoon today. The main airport is the Hanoi Noi Bai International Airport; use the airport code HAN when searching for flights. Upon arrival, collect your luggage, go through customs and look for someone holding a Toto Tours sign. You will be transferred to our centrally located hotel, and you will have the remainder of the day to rest and recover from the long flights. It is Valentine’s Day! Prepare to fall in love with Vietnam! Overnight in Hanoi. Take a leisure walk around Hanoi Old Quarter to witness the bustling local life reflected through small crowded streets where people have been trading things for centuries. Stroll through the streets and choose to stop at any stalls specializing in handmade goods, or simply enjoy local dishes if you wish. Vietnam today is a youthful nation fueled by the desire for modernization and commercialization while protective of its traditional past. Tonight, meet with a Vietnamese LGBT family and spend time with them to enjoy an authentic home-cooked dinner. Our discussions with the family will provide insights into local LGBTQ life and how they overcame discrimination and barriers from their parents. This morning we drive from Hanoi to Hai Phong, where we take a tender out onto the bay to board our luxurious craft, Era Cruise. You will be welcomed aboard and greeted with a complimentary drink. Our crew will conduct a compulsory safety procedures session and then you are free to check into your cabin and freshen up. Take some time to have a look around the vessel or watch the magical landscape go by. Enjoy a special lunch of fresh seafood and an assortment of appetizing favorites. Dining on a luxury junk with fine food and drinks doesn’t get any better than this! We set sail for Lan Ha Bay passing by Da Chong islet where you can see a lighthouse built by the French over 100 years ago. 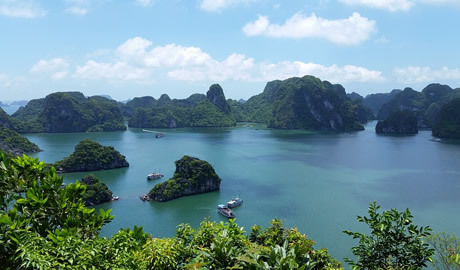 When lunch is finished, the cruise completes its entry through Cua Van area to Lan Ha Bay, surrounded by an extraordinary limestone karst landscape. You can explore Ba Trai Dao beach, where you may kayak on crystal-clear waters or go for a swim. Afterwards, our ship cruises to our overnight moorage. Enjoy a Vietnamese cooking demonstration, a great way to learn how to prepare delicious appetizers. Dine on a special signature dinner in the restaurant before spending the evening at leisure. Overnight onboard. Early birds are welcome to attend sunrise Tai Chi on the upper deck, an excellent way to get your energy levels up for today's adventures. Enjoy a buffet breakfast with the best local coffee and fresh fruit juices. Next, we board our Day Boat to head to Viet Hai Village. Enjoy a bicycle trip along a village path and go through rain forests and a dark tunnel. 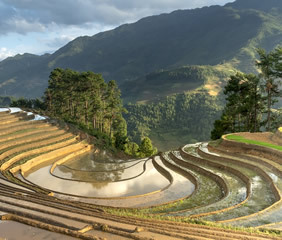 Be amazed by the stunning scenery of rice fields along the way. Stop at the village to relax and visit an ancient local house, made from straw, mud, bamboo. (Optional electric car service is available at an extra cost). Lunch is served on our day boat. In the afternoon we have free time for kayaking and swimming at the Ba Ham Lake area where all four sides are enclosed by vertical cliffs (if weather permits). In late afternoon, we re-board the ship and cruise to our overnight moorage. Witness one of the most brilliant sunsets you will ever see during happy hour. Then enjoy a cooking demonstration to discover how to make traditional Vietnamese spring rolls. After another amazing dinner of fine food, the remainder of evening is at leisure. Overnight on board. Wake up early to witness the sunrise over the bay on the sundeck. Afterwards there will be an early and gentle Tai Chi demonstration. Eat a light breakfast in the restaurant (pastries, tea, coffee) as we sail to the last adventure of your cruise: visiting caves and islets by local rowing boat. We return to the boat and cruise back to the wharf. Check out of your cabin as we draw closer to the mainland. After brunch and farewell to the staff and crew, we board the tender and head back to the wharf and begin the drive back to Hanoi. Along the way we visit an ancient village known as the birthplace of the traditional folk art of water puppetry, stopping at a workshop to meet the owner and watch a private outdoor water puppet show of 30 minutes on the village pond, with traditional music accompaniment. Continue to the airport to catch our evening flight to Hue. Upon arrival we transfer to our hotel and the remainder of the evening is free. Hue was the ancient former capital of Vietnam during the Nguyen Dynasty at the beginning of the 17th century. With its splendid emperors’ tombs and ancient pagodas, the Imperial Citadel Complex has been officially recognized by UNESCO as a World Heritage Site. We next see the Tu Duc Royal Tomb which was built on principles of “Fengshui” and designed to work in harmony with the natural scenery. Hue is the center of Buddhism in Vietnam with hundreds of temples and pagodas built in the early 19th century. We participate in a prayer ceremony to wish for health and prosperity for our families, bringing some offerings including some fruits & flowers to the monks. Afterward, enjoy a vegetarian lunch prepared by the nuns. Our final stop will be a visit with a famous expert working to preserve the unique and nearly forgotten Royal Enamel Art called “Phap Lam.” This art form plays a huge part in Vietnamese history, particularly in Hue where enamelware was used for imperial structures and royal families during the Nguyen Dynasty. After returning to our hotel, the remainder of the evening is free. Overnight in Hue. After breakfast, transfer to Hoi An by crossing the stunning Hai Van pass. The UNESCO World Heritage Site of Hoi An is an ancient town that boasts well-preserved buildings, pedestrianized streets and unique food culture. There is plenty to see including the old merchant’s houses with influences from Chinese, Japanese and Vietnamese architecture; the 400-year-old Japanese Covered Bridge; the Assembly Hall of the Chaozhou Chinese Congregation with outstanding wood carvings; and the colorful market with stalls brimming with local specialties including silk. Silk lanterns, simple and colorful, are an essential part of Hoi An culture meant to bring good fortune. Stop by a family-run lantern workshop and meet the owners whose family has a long tradition of making lanterns in Hoi An. They will teach you step by step to make your own silk lantern in different shapes and colors. Try creating your own lantern and take it home as a souvenir. We return to the hotel and the remainder of the evening is free. Overnight in Hoi An. Cam Thanh Village is known for dense water coconut jungles and immense rice fields. During the Vietnam war, Cam Thanh was a shelter for local people and soldiers. Nowadays, this place supplies seafood, vegetables and rice for the area. This morning we transfer to the picturesque Co Co River for a bamboo basket-boat ride to Thanh Dong village, which is the first and only organic farm in Hoi An. Get a glimpse of the history and customs of this charming village before venturing into the garden for some hands-on learning about how to cultivate vegetables without chemicals. Pick some of your favorite herbs and vegetables to prepare during a cooking class. Wander through the peaceful water coconut forest to a riverbank restaurant overlooking beautiful rice fields. Take part in traditional Vietnamese folk games such as bamboo bridge balancing and pot smashing, and then join in a hands-on cooking class. Enjoy eating what you have cooked. We return to our hotel in Hoi An for a free evening. The day is entirely free to relax and enjoy the pool and spa treatments at our luxurious resort, or explore more of Hoi An on your own. Hoi An was a very busy commercial port in the 15th, 16th and 17th centuries, where merchants from Japan, China, India and Holland came to trade. Almost all the original architecture of streets, ports, and religious buildings are intact, and the old city is in walking distance from our hotel. Pristine beaches are a lovely bike ride away. Overnight in Hoi An. This morning, we transfer to the airport and take a flight to Ho Chi Minh City, formerly known as Saigon. From the airport, we proceed to the Cu Chi tunnel complex, dug in 1948 for the guerrillas to hide from French air and ground sweeps. It also served as communication routes and food and weapon caches as well as hospitals and living quarters for guerrilla fighters throughout the American war. After seeing the tunnels we continue to downtown Saigon, the country’s commercial center. Although a modern city, there are still remnants of its past visible in the historic landmarks and beautiful French colonial buildings. We check into our hotel and enjoy some free time before our evening adventure. The darker the night gets, the more vivid Saigon becomes! Get ready for a fascinating ride by vintage Vespa tonight to discover Saigon after dark. Relax! You’re in the hands of an expert local Vespa driver. Just hang on!, On this dine-around tour we sample amazing street foods in the most authentic local restaurants. First we stop at a small Vietnamese bread stall, and then continue on to a local coffee shop, a boutique seafood restaurant, an old apartment complex with hundreds of food and drink stalls, a 50-year-old dessert shop, and finally a speak-easy bar to taste some local beer or cocktails and chat with locals. Take a walk or catch a taxi to return to our hotel. 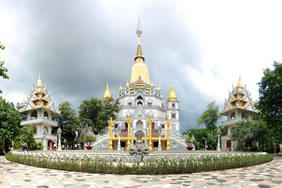 Depart from Ho Chi Minh City for a scenic two-hour drive to Cho Gao, situated in the Mekong River Delta. Upon arrival, board a wooden boat for a fascinating river excursion off-the-beaten tracks. Crossing two branches of the Mekong River, we arrive at Long Thanh Village for a stop at a local factory to understand the traditional methods used to make fuel from coconut shells. Afterward, hop on a bicycle for a relaxing ride through the peaceful village to observe the rustic lifestyle, riding among fruit plantations and friendly locals. Stop to visit an ancient house and a communal temple of the village. Then, cross by ferry to Tam Hiep Island where you will enjoy a leisurely walk to a local farmer’s house for a lunch of Mekong Delta specialties. After lunch, wander on the rural village path to a honey bee farm to observe how to make honey straight from the source. Continue the cycling trip around the village and stop at a local farmer’s garden with a specialty of the region called “lá sâm.” The host will take you around his lush garden to pick some leaves and show you how to make a special herbal jelly. Board a sampan for a ride along the narrow canals of the Mekong Delta before getting back on the ferry to cross the river and return to Saigon for a free evening. Overnight in Saigon. Enjoy a full-day walking tour of some of the city’s most historic landmarks. Visit beautiful French colonial-era buildings from the late 19th and early 20th century. 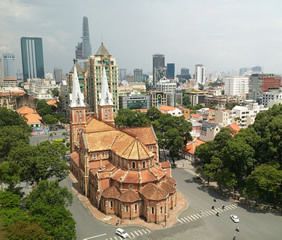 Appreciate the splendidly restored exteriors of the Saigon Opera House and the Notre Dame Cathedral, a red brick edifice with twin spires constructed from materials imported from France. Then head across the square to the Central Post Office, completed in 1891. Continue to the Jade Pagoda established in the early 1900s by Chinese refugees. 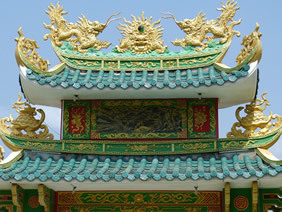 In Chinatown visit the beautiful Thien Hau Pagoda, built by the Cantonese community in the early 19th century to honor the Goddess of the Sea. Continue your visit to FITO, the first museum of traditional medicine in Vietnam. This evening, meet some proactive volunteers of a local LGBTQ organization in Vietnam and share with them your own experience and knowledge. Sip some mocktails or cocktails in a cozy room owned by a famous mixologist (also a lesbian), and talk more with the local LGBTQ community. From here we continue to a local restaurant to celebrate the conclusion of our tour with a festive Farewell Dinner. Overnight in Saigon. The main tour officially ends after breakfast this morning. We provide your transportation to the airport for your onward flight. If you wish to extend your stay in Saigon or continue to the extension to Cambodia, please let us know on your reservation form. After breakfast, transfer to the airport to take the flight to Siem Reap, located in north-west Cambodia. It is a charming provincial town defined by a cluster of villages, Chinese-style shop houses, and French-colonial architecture. Spend an enjoyable afternoon visiting places including: Artisans Angkor (a company helping young rural people find work near their home village in various arts); Wat Damnak, once a royal palace and now a major pagoda; and the new and old market on both sides of the river. Built in 1186 as a Buddhist temple, Ta Prohm is one of Angkor’s jewels and is overgrown with fig trees, giving a haunting yet exotic atmosphere. One of the largest temple sites in Angkor it took almost 80,000 people to build and maintain the temple. Drive a short distance to Ta Keo, which would have been one of the finest temples in Angkor had it been completed. Continue to Angkor Thom, not a temple, but an entire walled city of 9 square kilometres and the royal Capital from 1181. The centerpiece is the Bayon temple crowned with 216 giant, smiling faces of King Jayavarman VII. Also visit the Terrace of the Elephants and the Terrace of the Leper King, which houses almost perfectly preserved carvings. Return to your hotel to relax and have lunch (on your own). After a leisurely break we enter the rear gate of Angkor Wat (early 12th century). Surrounded by a vast moat it is thought to be the largest religious building in the world. The temple took 30 years and 300,000 workers to construct. In the evening, we attend a one-hour performance of the Phare Circus, an amazing blend of traditional and modern theatre, music, dance, acrobatics, juggling and contortion. Set off with a qualified instructor/guide for a half day trip around Siem Reap. Take in the sights of the beautiful surroundings and paddy fields, engage in local life as it passes slowly by. Visit Prei Monti temple, a 9th century structure that doesn’t draw the attention of many tourists. Enjoy a break and the taste of fresh coconut before returning to town. This afternoon is free at leisure to explore Siem Reap on your own. This evening enjoy a farewell dinner at The Khmer House at Srah Srang, nestled in a lush garden and featuring breathtaking views. The tour extension officially ends after breakfast this morning. We provide transfers to the airport in time to catch your international flight back home. • This is a fully guided and escorted tour extension. Located on the Lower Deck with a spectacular and vast ocean view, the Galaxy Coffee Lounge is spacious and comfortable and the perfect spot to unwind or chat with friends. Terrace Suite located on the first and second deck of the cruise and offer the space of 46m2, the cabins come with twin beds (1,1m x 2m for each bed) which are convertible to double bed (2.2m x 2.0m). Your private sun terrace will absolutely satisfy you with your own sunbathing beds, where you can relax with a cocktail and contemplate the marvelous view of the bay. En-suite bathroom is also sophisticatedly equipped with standing shower, Jacuzzi bath tub, high quality amenities and more. Skyline bar is the ultimate venue for a bite to eat with a glass of wine or an exotic cocktail. You can enjoy your evening’s refreshment either on the stern of the cruise ship overlooking the beauty of peaceful Lan Ha Bay or at our inviting indoor bar. Pilgrimage Village Boutique Resort & Spa is a rustic resort in a secluded area of Thua Thien Hue. It offers authentic Vietnamese culture and hospitality, extensive spa treatments, and different onsite bars and restaurants. From the property, guests can take the complimentary shuttle bus into Hue. 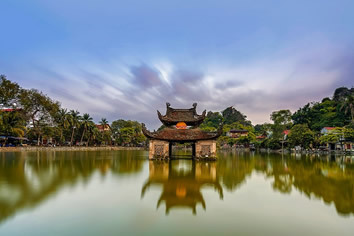 Nearby attractions include tombs of Khai Dinh, Tu Duc and Minh Mang. There are 2 restaurants, serving Vietnamese and international cuisine, and 3 bars that include a lounge. Boasting a 400 m² salt water pool and a 100 m² fresh water pool, Hoi An La Siesta Resort & Spa is spread over 2 wings in Hoi An. The fashionably traditional west wing offers 70 rooms, while the east wing accommodates 37 classic suites with the old town's characteristics. Guests can pamper themselves in a pampering massage at the spa, or relax in the garden. Free WiFi throughout the property and free use of bicycles are available. Red Bean Restaurant serves a range of Asian dishes, while The Temple Restaurant features European cuisine. Room service is available upon request. All air-conditioned rooms feature a private balcony that opens up to views of the swimming pool. A flat-screen TV with cable channels, as well as a laptop are available. All rooms are fitted with a private bathroom equipped with a bath. For your comfort, you will find bathrobes, slippers and free toiletries. Assembly Hall of the Cantonese Chinese Congregation and the Japanese Covered Bridge are 1.1 km from Hoi An La Siesta Resort & Spa, while Hoi An Ancient Town is 700 m away. Da Nang International Airport is 30 km from the property. The property offers complimentary shuttle service to Old Town and An Bang Beach. Parkson is 600 m from Le Meridien Saigon and Vincom Center B respectively. Tan Son Nhat International Airport is 7 km away. Every room has a flat screen TV. For your comfort, you will find bath robes and free toiletries. There is a 24-hour front desk at the property. District 1 is a great choice for travellers interested in markets, museums and nightlife. Located a 10-minute drive from Angkor Wat Temple, Le Méridien Angkor offers a fitness centre and outdoor pool. Rooms feature traditional Khmer designs including dark timber floors and rich silks. Free Wi-Fi access is available in the public areas, while complimentary parking is provided. The hotel is a 10-minute drive from the vibrant Old Market, Pub Street and Night Market. The floating village of Tonle Sap Lake is a 20-minute drive away, while Siem Reap International Airport is 14 km away. Rooms offer garden views and come with a minibar, tea/coffee-making facilities and a personal safe. Cable TV channels and a hairdryer are provided. Voted as Cambodia's Leading Spa Resort by World Travel Awards, guests can indulge in a pampering massage or relax in a sauna session. Bicycles and cars can be rented for guests wishing to explore the surroundings. Italian cuisine is served in L’Angelo while outdoor dining is possible at The Terrace. Other dining options include Angkor Royale Cafe and Lobby Lounge. Drinks are served at Naga Bar. For citizens of the United States and Canada, visitors must have both a passport (valid for 6 months from entering the country) and a separate visa for each of the two countries visited on this tour. Vietnam - There is now a fairly simple procedure for pre-registering to obtain your visa upon arrival. You must get an approval letter in advance. You can obtain your visa in advance through the Vietnam Embassy (or a Consulate). 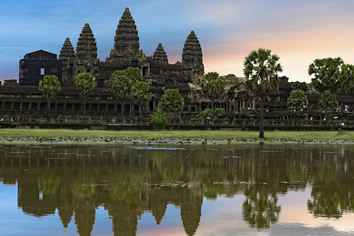 Cambodia - It is possible to obtain an electronic visa for travel to Cambodia. Click here for a link to the official Cambodia government e-visa service. 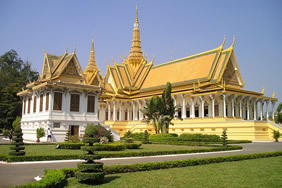 Visas can also be obtained in advance at any Cambodian embassy or consulate. 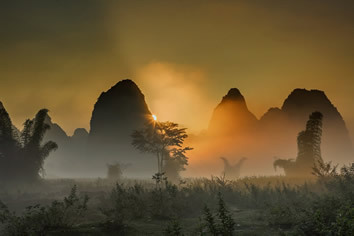 There is currently no separate departure tax required of visitors leaving Vietnam other than that included with the cost of your airline ticket. Please consult your personal physician or a travel clinic. Please click to visit the CDC website. 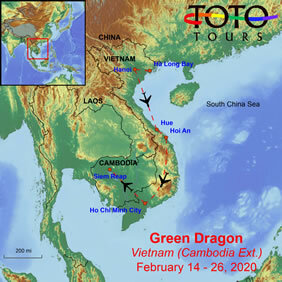 You need to purchase your international flights to Hanoi, Vietnam (code HAN), and back from Saigon (code SGN). 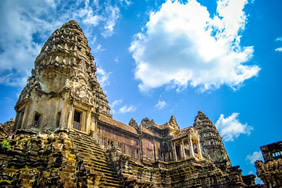 If you take the extension to Cambodia, you will return from Siem Reap (code REP). Gratuities make a huge difference in the lives of those who work for us here, as the local wages are minimal at best. We will make group tips where appropriate, and guidelines will be provided prior to departure with a suggested contribution to a group tipping fund. The recent trend in travel is for people to finalize their plans much closer to departure time than was customary in the past. While we try to be as flexible as possible we often must turn away last minute registrants because we relinquish hotel space and air reservations 8 – 12 weeks prior to departure! Please keep this in mind when making your travel plans. This unique tour of Vietnam provides unforgettable memories and personal interactions with members of the gay community, plus the opportunity for incredible adventures at the World Heritage Temples of Angkor in Cambodia. Mount the “green dragon” and fly with us to another world! If you have any questions, please email us.